By painting your cabinets, you can update your favorite room at a third of the cost to replacing them! As an expert cabinet painting company for over 27 years, we use top of the line products that come with guaranteed results. Wherever you have cabinets, we will paint them! Kitchen, bathroom, living room or foyer, Mars Painting has the expertise to instantly increase the value of your investment. In every painting project, Mars Painting strives for perfection and offer the highest level of workmanship. 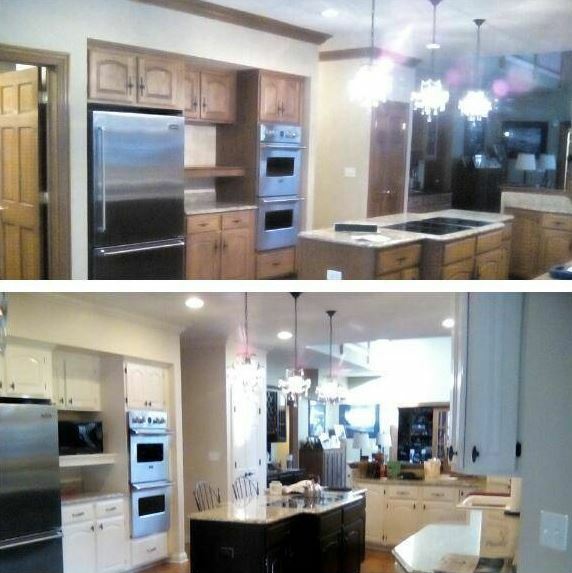 We will give your home a fresher, more updated look. Leave it to Mars Painting to apply your new look with professional detail and help you every step of the way. Whether you are looking to enhance the look of your cabinets by painting them a vibrant hue of turquoise, or you’re just looking for a subtle tone of off-white, Mars Painting will work with you to help select colors that are just right for you. Did you know that using a semi gloss finish will give your cabinets a richer look and makes it easy to keep them clean? We will also help you choose the best finish to ensure long-lasting results. On average, painting cabinets in a small-to-average size kitchen costs approximately $5,000-6,500. Full replacement of the same size would cost between $15,000-30,000. And in many cases, replacement costs could be greater than that as people tend to replace counter tops in the process, leading to electrical and plumbing work. Why spend more than triple the cost to replace your cabinets, when you can completely update the look of your kitchen or bathroom by painting them? Say goodbye to your outdated bathroom cabinets and your dull-colored kitchen cabinets. Say hello to your stunning new space! Call (224) 358-3538 today for a free quote.